In the second half of the 18th century Naples is characterized by the presence of two important public buildings, the Palace of the Studies – the current national archaeological museum – and the wheat moats. The presence of Square Mercatello – now Piazza Dante- next to Port’Alba, (Alba Gate) both defined an area of ​​possible expansion and construction of a middle-class district. The palace of Royal Studies, home of the University was conceived in 1612 by Giulio Cesare Fontana on a flat ground outside the wall system, following the will of Vice-king Count of Lemos. The wheat moats were built by the Vice-king Olivares in the 17th century for the storage of wheat, located close to the city walls and on a large slope, in the block connecting the Palace of Studies to Port’Alba stood the Church St. Mary of Constantinople and the Church of St. John the Baptist of the Nuns. In front of the Palace of the University there was Gate Constantinople on Constantinople Street, while Gate Sciuscella led to Port’Alba and further reaching outside the walls. With the obsolescence of the wheat moats, these were re-used for different purposes: prison, hearses store, barracks. In 1840 the wheat moats were proposed to be eliminated, as well as the demolition of Gate Constantinople and a regularization of Square Mercatello in order to build up a new road axis linking Toledo Street to the National Museum. 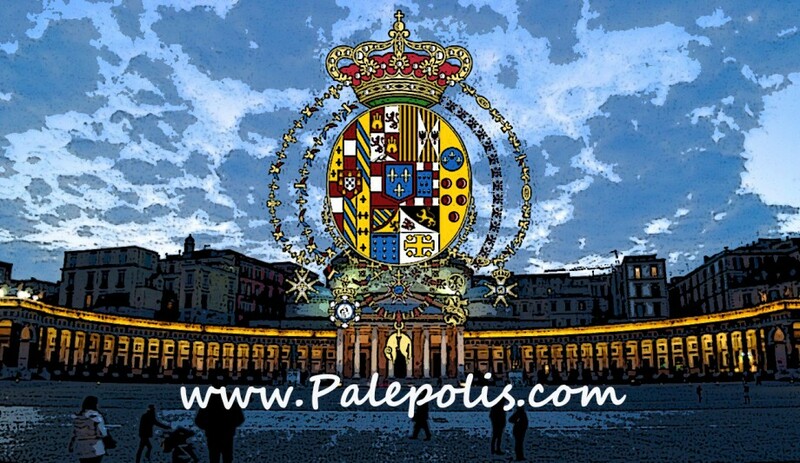 In the mid 1800s Ferdinand II conceived a program aimed at improving and enhancing the city’s urban structure, as to compete with the major European capitals. The Museum district project was undertaken in 1850 and was completed only after the Italy Unification and represented the possibility of building a new middle-class neighborhood with a large shopping gallery with artistic and commercial functions. The creation of the Museum district and of the Prince of Naples Gallery passed through proposals and projects very often modified due to excessive costs of construction works. In 1853 Ferdinand II examined the proposal of building a new City Hall, near and similar to the National Museum, which the extension of Foria Street was to follow to, and where numerous shops were supposed to be located. In 1859 an area restructuring is made, letting the convent complexes untouched, dividing the land into lots for residential construction, letting go of the idea about a new Town Hall. In addition, in anticipation of such works the Gate Constantinople and the wheat moats were demolished , smoothing and adjusting the slope to the Palace of Studies. The iron and glass architecture appears since the early 800s and represents one of the most important aspects of building techniques, both for the importance of innovation and the possibility that such buildings guaranteed great practicable spaces for the production and the trade . The iron – then cast iron – was used for cultural classical buildings across Europe – example : exposed iron beams in the Marble Palace in St. Petersburg – 1768/1772. In Italy there are remarkable galleries in Milan, Genoa: Mazzini; Rome: Colonna, now Alberto Sordi . The galleries are derived from covered structures for the crossing and walking, engaged mainly in commercial and service sectors, and represent a new type of architecture, becoming widespread due to great international exhibitions . The final solution of the Prince of Naples Gallery in the Museum district found its reason from these trends, and from the successful operation of the Gallery in Milan, placed in a key point of the city between the Cathedral and the Scala theater . This Gallery plays a role as city living room with adjoining places for social meetings and trade . 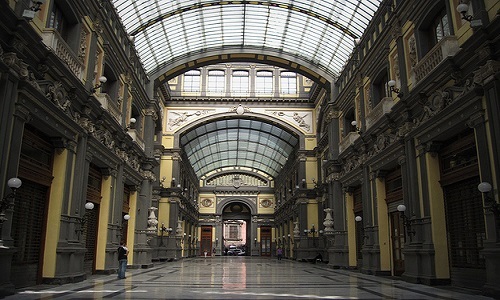 Until then, the iron and glass structures in Naples were quite limited and had only a public use: markets in San Pasquale a Chiaia, on Square Carità, or public passages as the internal corridor in St. James Palace, or monumental covers , like the dome of the church St. Francis of Paola . The Museum disctrict and the Gallery were completed in 1883 on the eve of the cholera epidemic that will transform Naples in a domestic case, which was followed by the rehabilitation works. In the Prince of Naples Gallery the presence of connecting stairways led to its small vision and its strangeness in the surrounding environment. It’s important to remember that the Gallery Hall was a privileged place for the holding of scientific conferences and public events. There was also a large presence of fashion styled coffee-shops, art shops, bookstores and antique shops. After Italy Unification, the municipality proposed a competition for the improvement of a road connecting Mercatello Square with the National museum, the projects received often did not take into account the preservation of historic buildings, and therefore they were refused. Only in 1862 there was the approval of a project for a straight road parallel to the one uphill to the Palace of Studies, that connected the National Museum square with the present Square del Gesù. In 1864 the Academy of Fine Arts was built, and together with the National Museum gave the area a strong artistic character. The Academy of Fine Arts is one of the best works of architectural production of the 800s, with elevations in neo-Renaissance style and a facade of worked and decorated tuff.